The National Salvation Front (NSF) issued a statement early Thursday on the dramatic developments in Egypt congratulating the Egyptian people on their insistence to hold firm to the goals of the January 25 Revolution. The statement also insisted that what has happened in Egypt is not a coup but rather a necessary intervention. "We would like to confirm that what Egypt is witnessing now is not a military coup by any standards. It was a necessary decision that the Armed Forces’ leadership took to protect democracy, maintain the country’s unity and integrity, restore stability and get back on track towards achieving the goals of the January 25 Revolution. We have full confidence in the commitment the Armed Forces made yesterday that their role would remain to be a national one, and not political, aimed at restoring stability, security and fulfilling the economic and social rights of the Egyptian people." said the NSF statement. "We believe that the joint decisions reached in the meeting yesterday between the Armed Forces and several national forces, and witnessed by respected spiritual figures such as the Grand Imam of Al-Azhar and Coptic Pope, those decisions further confirm that the Armed Forces have no intention to intervene in politics," the NSF stated. 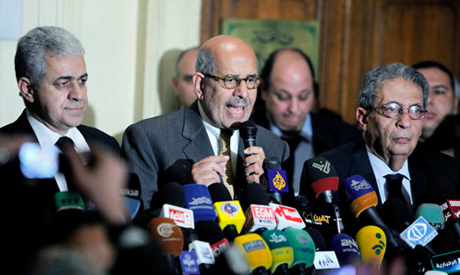 The NSF underlined that no political forces or parties should be excluded in the coming phase in Egypt. "We confirm our strong belief in the right of all political groups to express their opinions freely, and to form their own political parties. We totally reject excluding any party, particularly political Islamic groups. We stress that the achievement the Egyptian people made lately, obliges us to reconcile with all parties, and to confirm that the priority now is to remain united while facing serious challenges." said the statement.